Most students find the data representation questions in the Science section to be the easiest type of passage on the ACT — not coincidentally because it usually has the least text. The ACT has two to three data representation passages, each with just five to six questions. Here’s a sample data-representation passage for you to try. Very few humans live to the age of 100. In other words, almost all members of the human population who were born in a given year will die within 100 years. Scientists, health professionals, and life insurance agents are interested in examining how many people in a population will live to be a certain age. One way to measure this information is to look at how much of the population has died after a certain number of years. A graph documenting the results of one such study is presented here. Percentage of the population that has died after years since birth. 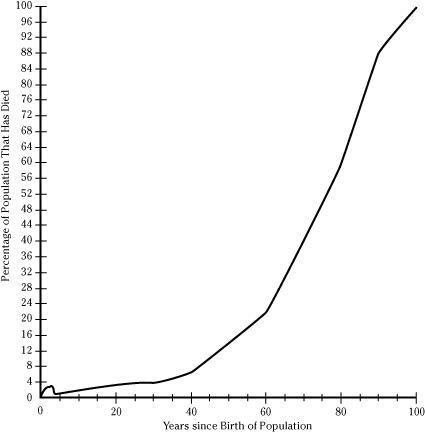 According to the figure, approximately what percentage of the human population lives to at least 80 years of age? The increase in percentage of deaths is highest for which of the following intervals? Not to worry. This question is a basic test of your graph-reading skills, with a little twist thrown in. First, find 80 years on the horizontal axis. Go straight up from this year (your ACT answer sheet can serve as a straight edge) until you hit the plotted curve. Next, go straight to the left to find the percentage of people who have died. But watch out: If you chose Choice (C), you fell for the trap. The question asks for the percentage alive after 80 years. So you must subtract 60 percent from 100 percent to get 40 percent. Get into the habit of circling precisely what the question is asking for. In this case, circle the word alive so that you keep in mind that the percentage alive is what the question wants. The correct answer is Choice (J).